iOS has changed the way we write. The ultra-minimal, file-free workspaces we use on our iPhones and iPads have gradually made their way to our Macs, making formatting toolbars and nested folders all but obsolete. 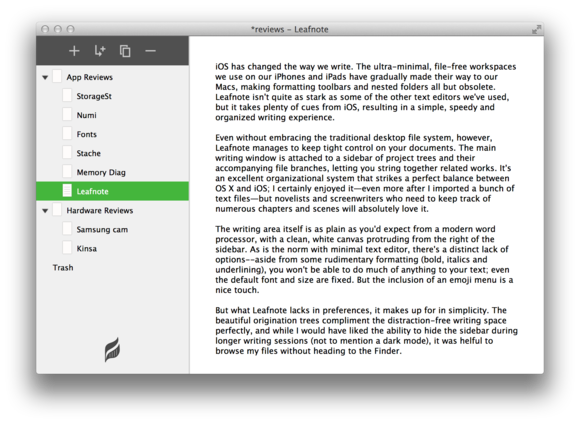 Leafnote (Mac App Store link) isn’t quite as stark as other text editors, but it takes plenty of cues from iOS, resulting in a simple, speedy, and organized writing experience. The writing area itself is as plain as you’d expect from a modern word processor, with a clean, white canvas. As is the norm with minimal text editors, there’s a distinct lack of options—aside from some rudimentary formatting (bold, italics, and underline), you won’t be able to do much of anything to your text. Even the default font and size are fixed, but the inclusion of an emoji menu is a nice touch. Even without embracing the traditional desktop file system, however, Leafnote manages to keep tight control on your documents. 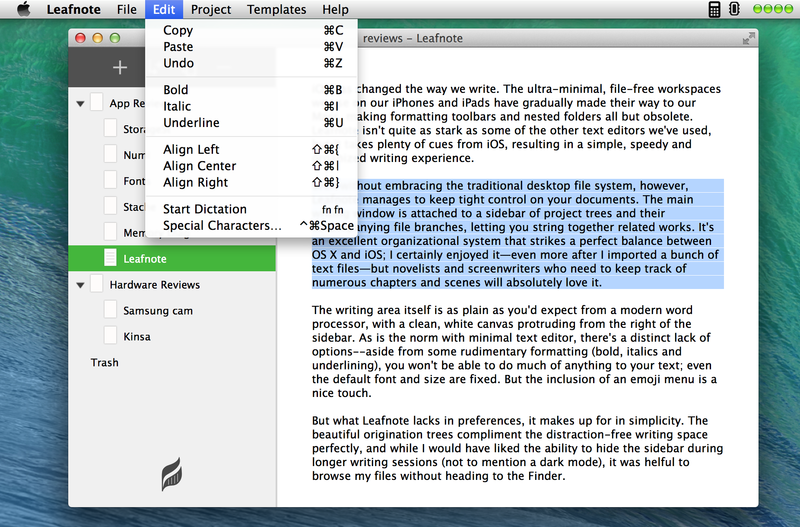 The main writing window is attached to a sidebar of project trees and their accompanying file branches, letting you string together related works. It’s an excellent organizational system that strikes a perfect balance between OS X and iOS; for example, I created a Reviews project that collected all of the apps I was testing in one neat file, but each section was still able be exported as its own entity. I found it fun and useful, but novelists and screenwriters who need to jump between numerous chapters and scenes will absolutely love it. Leafnote lacks in preferences, but it’s still a very enticing app. The organization trees compliment the distraction-free writing space perfectly, and while I would have liked the ability to hide the sidebar during longer writing sessions (as well as a dark mode), it was helpful to browse related files without heading to the Finder.